Authors: Katherine Fricker, Mary McKeown & Diana Toyn. ISBN 9780955135620. 394 pages Price �. Katherine Fricker, Mary McKeown and Diana Toyn are to be congratulated on producing an excellent and worthy successor to Dorothy Richard抯 1991 Biddenham parish history and guide. In 380 pages they describe the village抯 development from Domesday to last year抯 Diamond Jubilee celebrations. The volume is well-researched, drawing on a wide range of archive and newspaper sources, fascinating interviews with past and present residents, and local memoirs. The book is lavishly illustrated, with over with 100 black and white figures and photographs and seven colour plates, together with forty excellent colour photographs by Roger Day which accompany the final section � 慉 walk around Biddenham village�. There is an excellent detailed chapter on St. James抯 Church and its incumbents � one of whom, the Reverend William Norman, was an enthusiastic antiquarian and collector who gave a lecture about the history of Biddenham to our Society in c.1920, the text of which is preserved in the County Archives. The authors go on to document the rivalry between the Boteler and the Dyve families in the 16th and 17th centuries, feuding over land and taking different sides in the Civil War. These are followed by chapters on village life and agriculture to 1914, including lace-making, local farms and farmers, and Charles Howard抯 internationally recognised work to improve sheep and cattle stock. There are delightful vignettes (Graham-White was an aviation pioneer, one of the first Englishmen to qualify as a pilot; there is a description of his flight to Biddenham in 1911, attracting large crowds) and snippets (recipes for rook pie, 揵ignings� � an egg custard made from the first milk of a cow after calving, and the clanger). Subsequent chapters describe the impact of the First and Second World Wars on Biddenham (three bombs fell on the village � all from the same plane), the school, post-war growth, and flora and fauna. Three features of the book make it a particularly compelling read. First, five memoirs written by people who lived in Biddenham from the early to mid-20th century. These personal accounts provide vivid insights into local life and events. Jonathan McKeown抯 擬emories of Coarse Fishing� will especially appeal to anglers. Second, recollections of childhood in Biddenham from the 1920s to 1990, tracing the lives of local children. Lastly, an illustrated walking guide, covering 36 buildings, including the Church, the Tree Tuns, the Georgian Biddenham House, Manor Hospital, and more modern pre-1939 buildings such as Windmill House (designed by E. Inskip) and Three Gables (17 Biddenham Turn) the first house in Biddenham Turn (designed by C. Meadows). Could this walk form the basis of one of our summer trips? 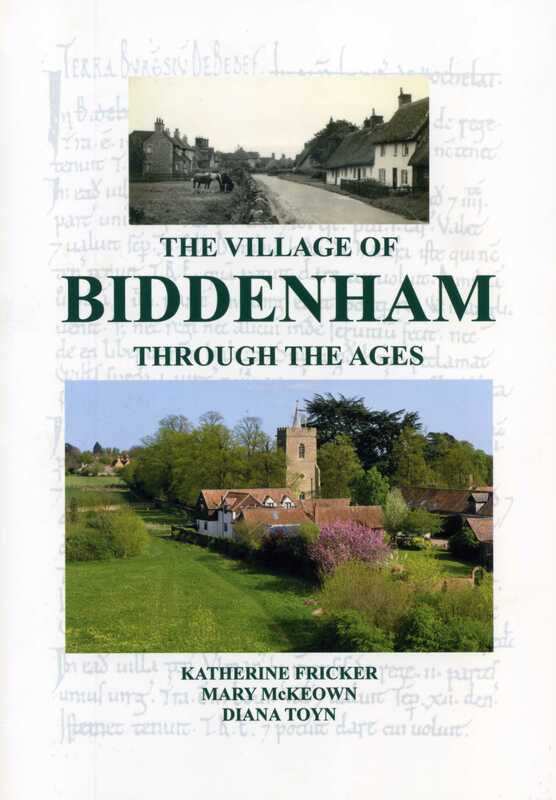 Rating: 憁ust read� for anyone with ties or an interest in Biddenham ; a 憇hould buy� for local historians and researchers � it deserves a place on your bookshelf. I found it invaluable in researching a forthcoming article on Biddenham in 1891.